In the four-part series, each novel represents a new aspect of the Phantom story, leading the characters forward along a journey in which love and hate are continually changing. The novel that inaugurates the series finds the Phantom resolved to disappear. Based on the story of the Phantom of the Opera, The Phoenix of the Opera recounts what happened after the Phantom set Christine Daaé free and disappeared deeper into the system of tunnels under the destroyed Opera Populaire. The novel brings together the main characters from the original story and the subsequent versions in the Andrew Lloyd Webber play and the 2004 Schumacher film based thereon and explores the complex weave of desires and fears that forever bind them together. Delving into the psychologies of the characters, The Phoenix of the Opera creates a new story in which these now mythic characters continue to develop and face new challenges. In relinquishing the woman that has obsessed him, the Phantom steps through the broken mirror to the other side with the intention of burying himself away forever. But he is unaware that Christine's friend, the young Meg Giry, has always been fascinated by him. Following him deeper into the dark tunnels, she offers the Phantom a second chance to live and love. The question is "Can the Phantom renounce his obsession for Christine and love another?" Who dared follow the Phantom to his living tomb? Christine had broken his heart. Would her friend Meg Giry find the strength to heal it? The Phantom of the Opera had released the love of his life, Christine Daaé, from his possession and retreated to his subterranean lair—to die. Young Meg Giry remained fascinated with her friend’s captor, whom she would not permit to destroy himself. Through Meg’s care the Phantom returns to life and makes his courageous savior his protégeé. But can the Phantom, hunted by Parisian authorities and Christine’s husband, the dashing Count de Chagny, escape his criminal past? Can he forget his first beloved or will he continue to haunt Christine, as she does him? Will Meg, who hungers for his love, be able to heal his heart and make him her own? The Phoenix of the Opera explores the limits of redemption and the power of love, taking us into the tortured souls of its protagonists. It is a grand tale of despair, obsession, rekindled passion, and the power of love. Now for something different: Visit my friend Stef Cole's webpage for a different take on the Phantom story. 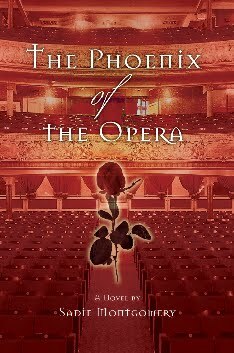 The Phoenix of the Opera, Book I in the series of the same name.